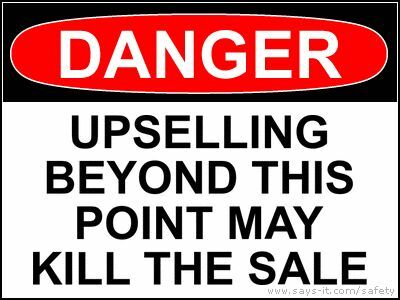 Trying to upsell before the buyer has actually been fully closed on the first part of the sale is a risky strategy. One of the most important things for a salesperson to learn is how to stop selling when the sale is made. Today I had an experience that reinforced that concept for me. I thought we all might benefit by breaking it down. I pulled into a local supermarket chain to buy gasoline. I’m rather brand loyal to this chain because of my discount points, so I made a special trip to get to this particular location for the discount. While I was pumping gas, a gentleman in a pink traffic vest walked up and commented on the sports logo on the back of my vehicle. He misidentified my team, but it was a fair mistake. He introduced himself, and then Jonathan and I talked about football for a moment. He transitioned smoothly into explaining why he was there. Jonathan was polite, respectful, and had a great personality. He introduced the product, a cleaning wax for cars, and deftly but politely convinced me to let him demonstrate it. After all, my car wasn’t going anywhere until the tank was filled, so this was a pretty smart place for their company to set up a sales promotion. They had the approval of the supermarket, which was making a donation to breast cancer research for every purchase. The product worked great. Every benefit he described got me thinking about how great it would be for our three vehicles, even though I’m not really the type to go out and wash and wax our cars. The idea of helping to facilitate a research contribution was nice, as was the idea of the bonus discount points I’d get for buying the product. I was waiting for the price. Jonathan followed his script smoothly and without seeming like a robot. He introduced it at a high price point, then led into why there was a discount during this promotion. And of course, this promotional price would cover two cans, not just one! They were set up to manage all the purchases through the supermarket’s own purchasing system, so there was no concern about fraud or identity theft. I had every reason to believe this was on the up-and-up. After I filled up my tank, he motioned me to a parking space because the gas pumps needed to stay open. Fine. Where do I sign? 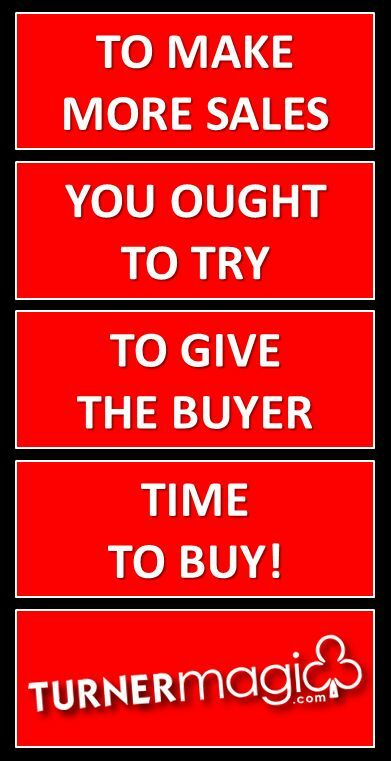 Give your buyer a chance to buy what you sold him before you introduce new complications. I saw four cans shrinkwrapped together. I thought it was an upsell to 4 cans. I listened. Instead, Jonathan showed me a 4-can collection including this stuff I liked, plus 3 other products, all packaged together. For twice the original price, he explained that I could get all of this stuff – usually sold at twice the new price! – and the two cans I was interested in would be included as a bonus. This was the point where the salesman lost me. The sale was all but concluded, and then I got three other things to consider, a new price point to weigh, and worst of all, an opportunity to make a comparison between what I was ready to buy and something I really didn’t want but was part of a package deal. First, I had already expressed a reservation about my natural tendency not to put extra effort into washing my car. A wash at an automated car wash is fine, and the occasional detailing is a bonus. I am just not the type to go out in my driveway and wash the cars. Watching Jonathan show me the product in person got me to at least consider that I might be able to muster the wherewithal to use his product. But when three new products were introduced, all with their own specific uses, I was certainly not interested in the amount of work that all of those different cans represented. Second, the new price point was twice what I was thinking about when I moved to buy. That gave me pause. Yes, it was for a 4-pack PLUS the original products, but it was still double what I had expressed interest in spending. Finally, the new bonus pack gave me a new value comparison. Suddenly, the original price for the first two cans didn’t seem like such a great deal if they were just going to be thrown in for free with the double-priced bundle. Why pay 50% of that for just the two cans? Yes, the bargain on 6 cans was supposed to be an incentive, but if I only wanted the two cans of the original product, now it felt more like an unnecessarily expensive proposition rather than a discounted promotional price. I told Jonathan the truth. I had only come to the store for bread and laundry detergent. I was buying gas and he got my attention, but we passed my buying point when the new products were introduced. I said I’d think about it but the moment had passed. It wasn’t entirely Jonathan’s fault. He is a talented salesperson, but the process he was required to follow pushed him into introducing the upsell before my debit card was ready to run. I chose to save 100% on the purchase by skipping the initial offer when it stopped feeling like a real discount. Are you rushing past make the sale to complete a script or a process? If so, you’ve gone too far! Are you rushing to your upsell? Jonathan didn’t exactly rush, but he didn’t close the initial sale before the upsell pitch. Is your upsell priced so as to make the initial offer seem significantly less valuable? Jonathan didn’t control the pricing, but the way the package was presented made what I was about to spend on just two cans seem wasteful or even insulting, since they were going to be described as free bonuses moments later. Is your sales script or process forcing your reps to keep going rather than making a sale at the moment of truth? Jonathan had smoothly transitioned through all the steps prior to this using his considerable instincts and ability to relate to my objections. However, he seemed to be required to attempt the upsell at a certain point due to any number of factors, but probably either scripting or a limitation of the payment process. Maybe it was his own decision and he just picked a bad moment. Whatever the case, it definitely made him stumble on the close and it lost him the sale. I wonder where respect fits in this sales equation. It seems the person who “asked Jonathan to make sure you knew about this” was looking for a buyer who could be talked into something based on a manipulative tactic, instead of a loyal client who placed value ahead of price. It really elevates the role of a professional salesperson, doesn’t it.